The information presented on this page was originally released on April 3, 2017. It may not be outdated, but please search our site for more current information. If you plan to quote or reference this information in a publication, please check with the Extension specialist or author before proceeding. I don't claim to be an entomologist, but I do find the insects and spiders we see in our gardens to be engaging. I ran into one interesting bug early one summer morning the first year I moved to Mississippi. I was strolling along my fence under the overhanging trees and walked right into the web. It was one of those moments when all of my latent karate moves were put on display. After calming down, I noticed this wasn't an ordinary spider web. It was backlit by the sun and glowing a rich, gorgeous golden yellow. And then I saw the spider, a huge spider. 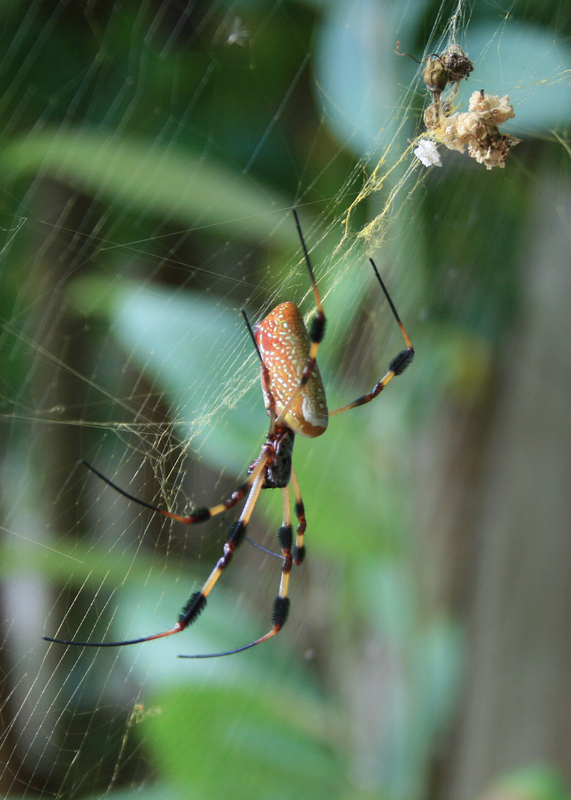 Called the Golden Silk Orb Weaver, the female is the web weaver. This spider, which is about 3 inches long, is found all along the Gulf Coast, as well as Central and South America. The female’s coloration consists of yellow spots on a muted, orange body with long legs banded brown and orange. The males are much smaller and more inconspicuous. That figures. As flying insect predators, these spiders are good guys. But it’s the web that I find intriguing; the strands of silk are really strong. I found references that indicated the silk surpasses the strength of Kevlar and has a tensile strength greater than steel. It has been known to snare the occasional hummingbird. While big and scary-looking, the Golden Silk Orb Weaver is not dangerous to people and is rather shy. The next interesting bug can be a little disconcerting for the unsuspecting gardener. It’s bound to happen this summer: I’m going to get a panicked phone call from a homeowner saying it looks like their oak tree’s trunk and branches are covered with webbing that looks like pantyhose. I’ll be asked if their tree is going to die, and I will happily calm the caller down and say the tree is going to OK. The webbing is caused by a member of the psocid family called bark lice. Bark lice are small, soft-bodied insects about 1/8-inch long that live under the protective webbing. They feed on the algae, lichen, fungi and molds that naturally grow on tree bark. The webbing is almost never found on the tree foliage. Long periods of high humidity in the summer and early fall across the Gulf Coast are conducive to invasions of these insects. It is not uncommon for the webbing to start at the bottom and proceed all the way to the top of a tree. The webbing is fragile and can disappear as fast as it appears. There are no control recommendations, as infestations do not damage trees, and the bark lice will leave on their own accord. 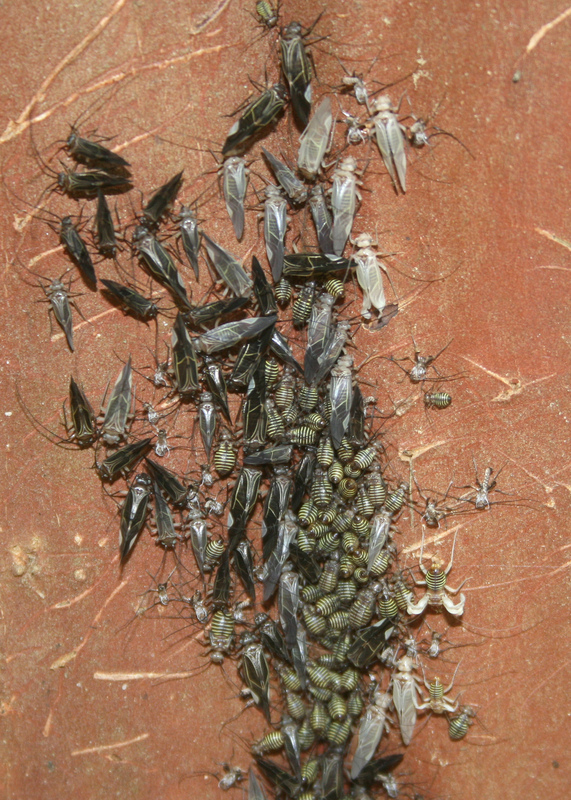 If you are really bothered by the bark lice, a solution of 2 to 4 tablespoons of dish soap per gallon of water sprayed on the webbing may encourage the insects to leave and find another tree.